These pieces are made to order, and are available in four to six weeks. Note: pictures are not to scale. Large Metalic Glazed Floor Vase with handle. This piece is thrown porcelain with a detachable lid. It stands alone or can be utilized for tall arrangements. The handle is stained walnut and is custom made for each piece. Its overall height is 22". Iron Mountain Teapot with walnut handle. This piece is thrown in stoneware and the handle is custom made in walnut. It will hold 1 quart and is 12" tall. Porcelain floor Vase with Copper Red. This floor vase has a detachable lid. 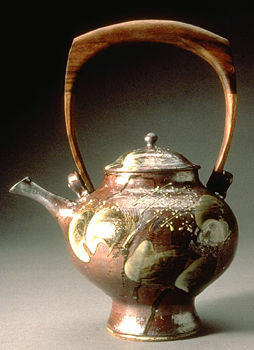 It is hand thrown and decorated with copper red over-glaze. It stands alone as a decorative piece or can be used to create tall arrangements. Its handle is custom made for each piece. It is made of walnut and stained with a ruby aniline dye. It is 22" tall. 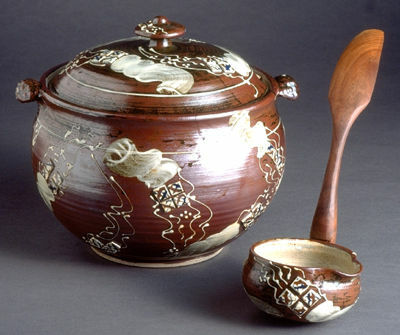 Soup Tureen with matching ladle. This fully functional serving piece is decorated in a variation of Iron Mountain that has small feather slip chips incorporated into the design. The handle for the ladle is walnut and is sealed and food safe. The handle is cut, fit and pegged into a ceramic tang that extends out from the bowl of the ladle. The Tureen holds one gallon.